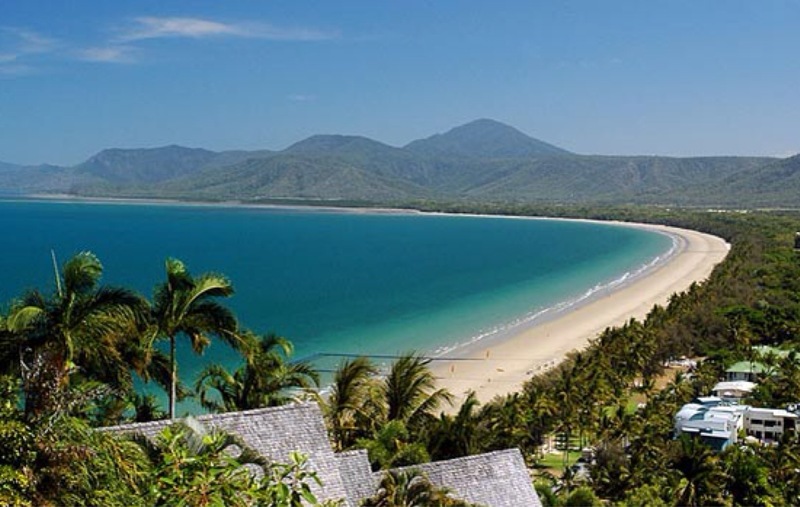 Cairns is a modern, sophisticated city, and is an ideal base to explore the wider Tropical North Queensland region with front door access to World Heritage listed Reef, Rainforest and Outback. 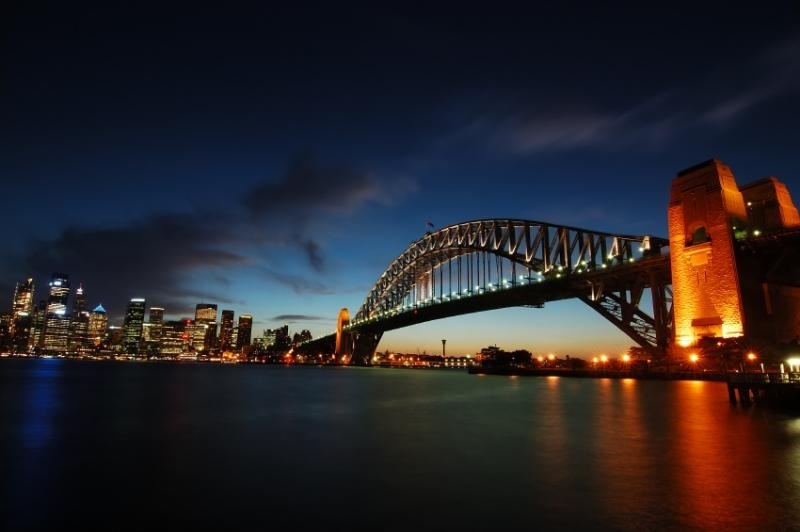 The city itself is where much of the accommodation is situated close to international standard restaurants, boutique shopping, modern art galleries and evening entertainment. All the attributes of a world class modern city are to be found in Cairns: International air access, rail systems, high-standard accommodation facilities, an art gallery, botanic gardens, university, a casino and a convention centre. Over a century of architecture is reflected in the city streets – a comfortable blend of traditional Queenslander style and modern designs. There is enough of the old Cairns left for the astute visitor to imagine what the city was once like. Modern buildings grace the cityscape with a mixture of architectural designs including the Reef Hotel Casino, Cairns International Hotel and the Cairns Convention Centre. A focal point for the city is the Cairns Esplanade. Almost two kilometres of landscaped parkland fringes a busy thoroughfare and restaurant strip on one side, and a natural harbour inlet on the other. Each year, thousands of visitors flock to the Esplanade to relax on the grass, eat at sidewalk cafes, meet new people, to walk under the trees, and to watch the many bird species which come to feed on the tidal zone. 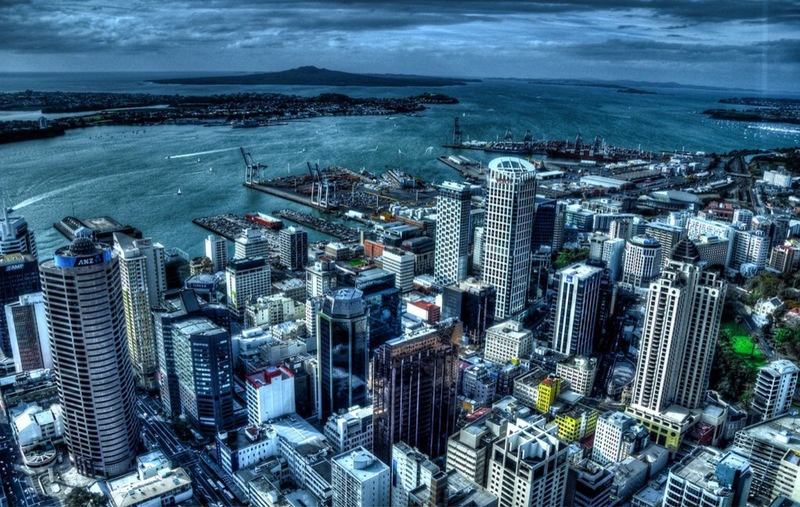 Very quick stop in Auckland .Time to move to Sydney. Fiordland is New Zealand’s largest national park at almost 3 million acres. It covers much of the southern part of the South Island’s West Coast. The Sounds in Fiordland are arguably the most beautiful places in New Zealand, and that’s saying something! Wildlife, waterfalls, unforested valleys, crystal clear lakes, and elegant mountains are what make up the views, and the only signs of human inhabitation are the tracks running deep into the bush, and the cruises down the sounds. Milford Sound is truly breathtaking. So much that it often attracts the title of “The Eighth Natural Wonder of the World”. Fiordland is one of the wettest places in the world, and is as beautiful raining as it is with clear skies. When it rains, waterfalls spring up anywhere, too many to count. Cruise ships going into Milford Sound can take you right underneath massive waterfalls, and the whole 16km to the end of the sound, where you meet the vast, angry Tasman Sea. Doubtful Sound is the second longest in Fiordland at 40km long. On a cruise down Doubtful Sound you will experience more shades of lush green than you knew existed, while you drift over 420 meter deep water. In both Milford and Doubtful Sounds, you will experience a host of wildlife; seals and crested penguins gather on the shores, and sometimes bottlenosed dolphins can be sighted playfully swimming along side the boat. Te Anau is the centrepiece town of Fiordland, is the starting point for famous southern walking tracks the Milford, Kepler, and Hollyford tracks. Located on the shores of Lake Te Anau, with full view of snowy mountains, the scenery makes the town a relaxing destination. Take a short cruise to see the unique glow worm caves, the only freely changing ones in the world. This is the best place to base yourself while exploring the sounds. Next I will take you to Auckland. Bluff is a town and seaport on the southern coast of the South Island of New Zealand. It is the southern-most town in New Zealand and, despite Slope Point being further to the south, is generally referred to as the southern extremity of the country. 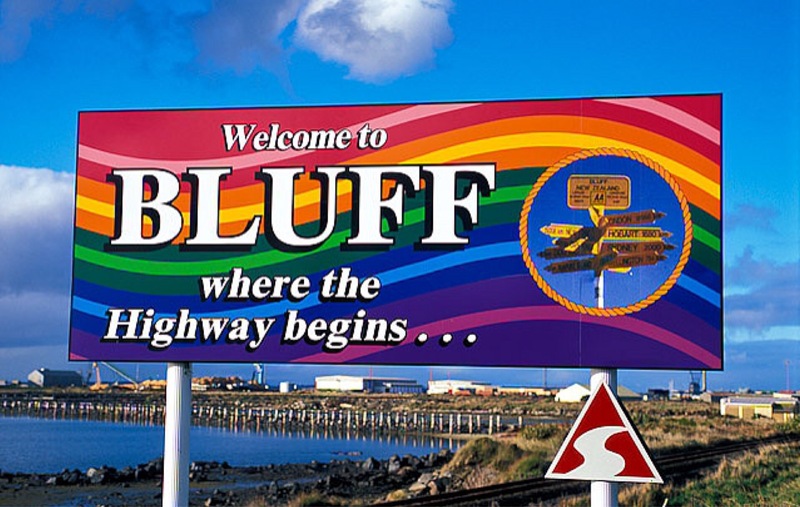 Bluff is renowned for its oysters, which are reputed to be the best in the world. There is an annual oyster festival and the Bluff Maritime Museum has exhibits which focus on oystering, whaling and shipwrecks. A signpost at Stirling point indicates the distance to the South Pole and other destinations in the world. The Kerguelen Islands or the Kerguelen Archipelago is a group of islands in the southern Indian Ocean. It is far far away from any civilization. It was discovered in 1772 by a French expedition and currently is a territory of France. 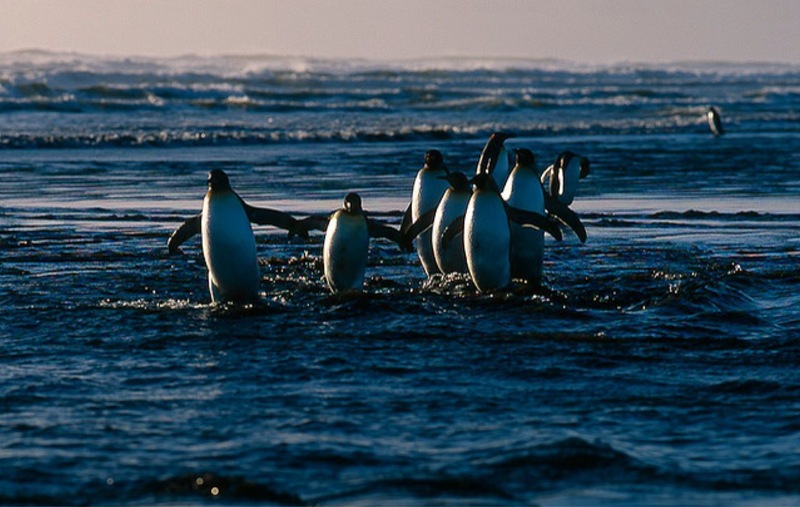 The Kerguelen Islands are located at 49°15′S 69°35′E. This places the archipelago just outside of the Antarctic circle. 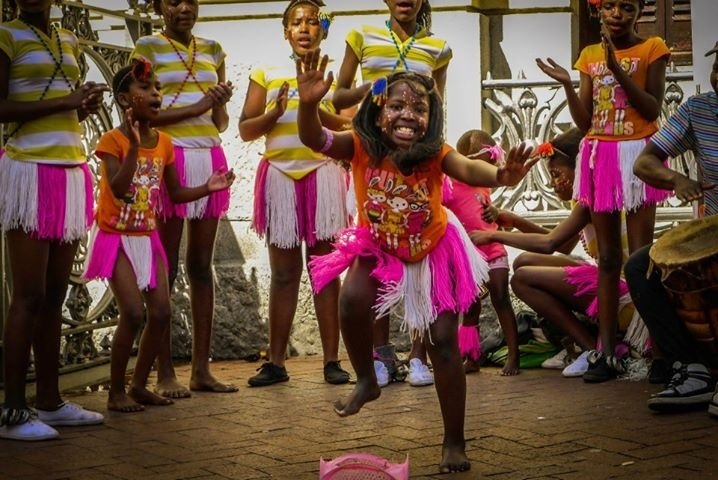 The main island, Grande Terre, originally called Desolation Island, is 6,675 km² and it is surrounded by another 300 smaller islands and islets, forming an archipelago of 7,215 km². All the islands combined, it is slightly larger than the state of Delaware. The climate is cold and very windy and the seas are usually rough. The population of these islands is only about 110. Most are scientists or weather watchers. There is no risk of crime. Only danger may be the cold or getting lost. Arriving to Cape Town 14 of march 2008 ,it is great time to start my 4 years trip around the world .day by day I will try to post new story about the places where I have been and what I have seen . 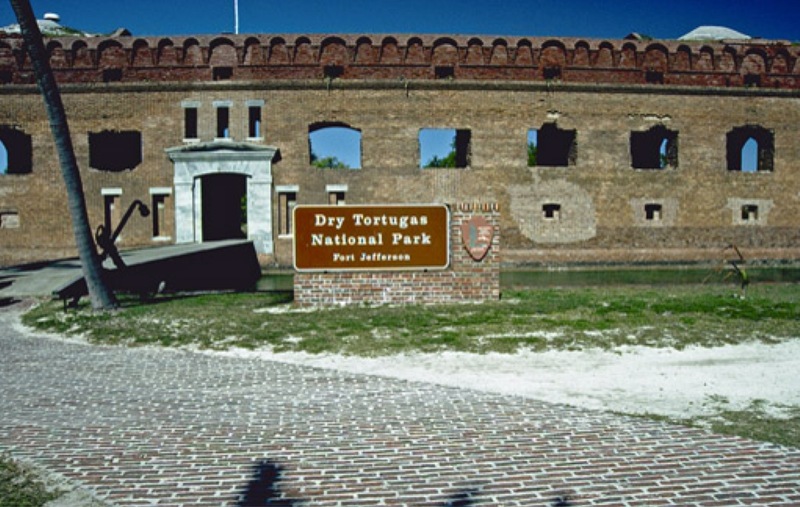 Perhaps the most unusual national park in the national park system is Dry Tortugas. It’s one of the smallest, one of the most remote, and one of the least visited. But it’s nevertheless a wonderful park, comprising seven small islands, coral reefs and other undersea attractions, and nesting areas for a variety of wild birds. The park includes some 64,657 acres of land above and below the water line. 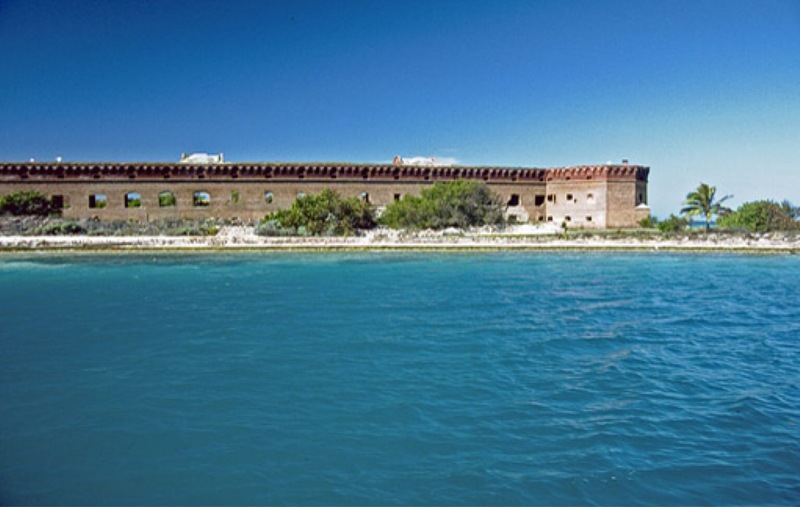 During and after the Civil War the fort began to be used as a prison for deserters and other criminals. 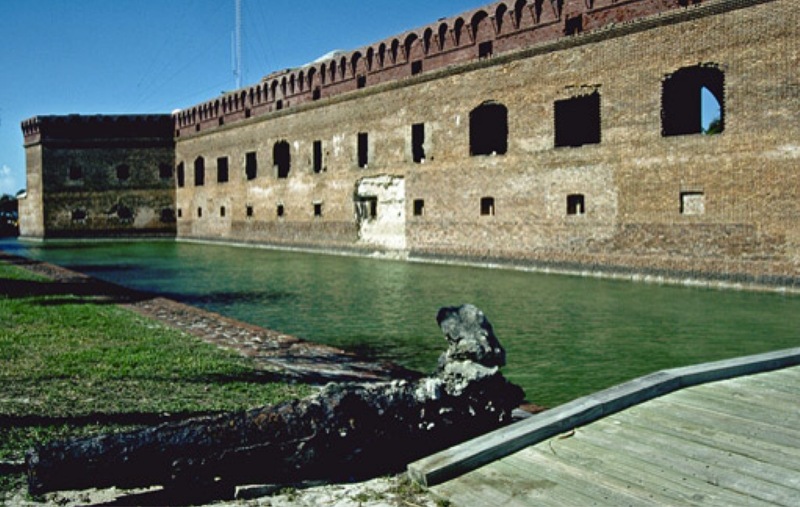 In 1874 the army completely abandoned the fort after several hurricanes and a yellow fever epidemic, and it wasn’t until 1898 that the military returned in the form of the navy, which used the facilities during the Spanish-American War. 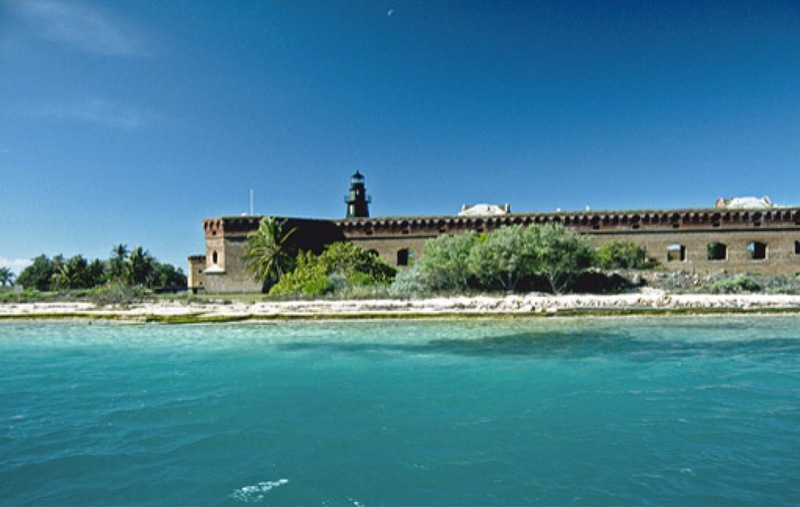 The fort was also used from 1888 through 1900 as a quarantine station, and was garrisoned again briefly during World War I. In 1908 the area was designated as a bird reserve and transferred to the Department of Agriculture. 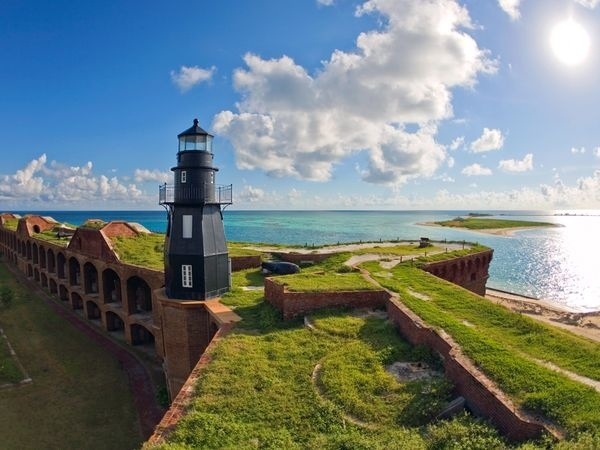 On January 4, 1935 it was designated as Fort Jefferson National Monument by President Franklin Roosevelt, the first marine area to be so protected. On October 26, 1992 the monument was upgraded to National Park status in a bill signed by President George Bush. There’s no “easy” way to get to the Tortugas. The islands are located about 70 miles west of Key West in the waters of the Straights of Florida. A four hour boat ride is necessary to cross the waters of the straight which connects the Atlantic Ocean and the Gulf of Mexico. 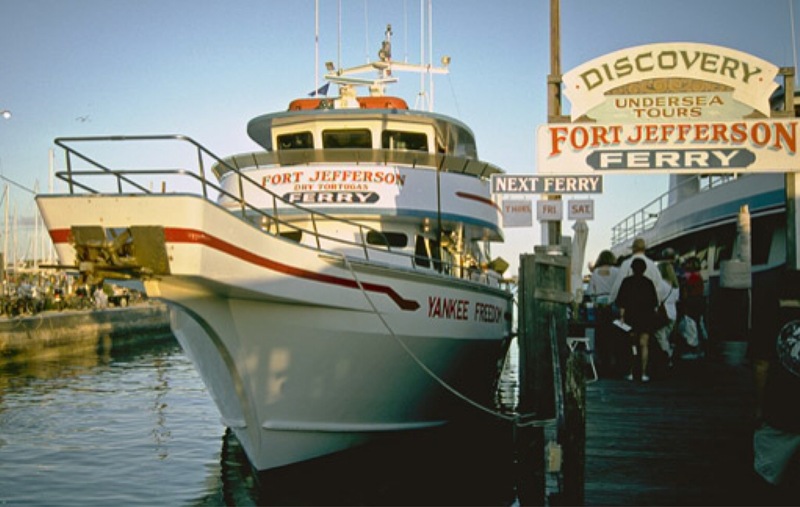 Excursions are available on ferries by operated by several concessionaires, one of which can be seen below as it appeared in the 1996-1997 season. Little land is seen on the trip, except for a glimpse of the tiny Marquesas Islands not far from Key West, but the waters of Gulf are exceptionally beautiful. 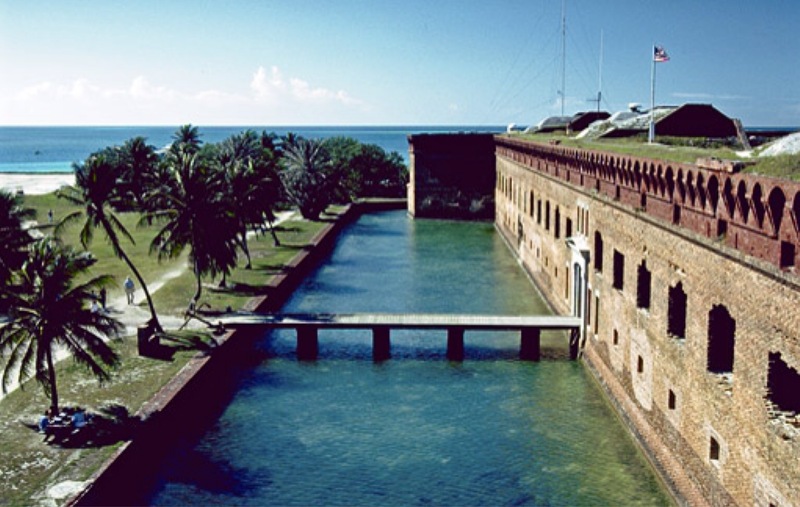 The imposing outline of the walls of Ft. Jefferson on Garden Key eventually comes into view, seeming so incredibly improbable in the middle of nowhere. 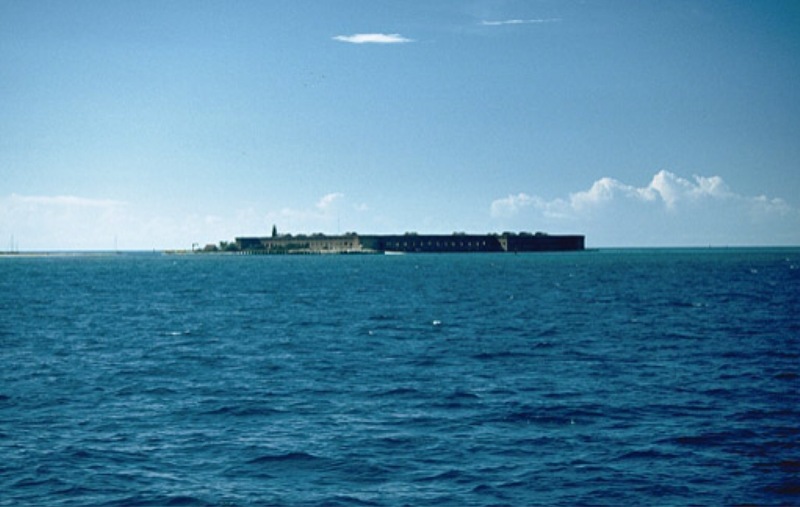 The boat swings around the island, and the southeast corner of the fort can be seen, along with the beach which is evident on the southern portion of the key. These first views of what was the 19th century’s largest coastal fort are particularly impressive. Garden Key is almost completely covered by the fort. 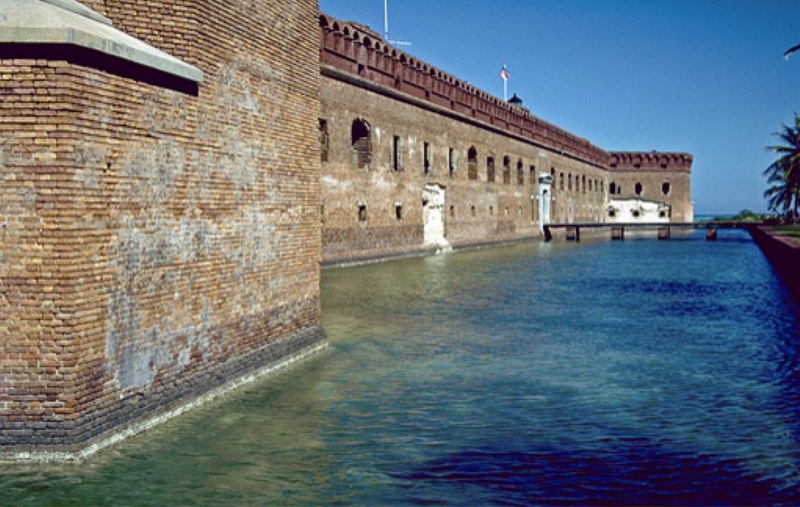 The red brick walls of the fort contrast strikingly with the blue-green waters of the Gulf which surround it, as can be seen in the picture below. Another view of the fort, and the lighthouse, is shown here. For some visitors there is a faster way to reach the park–by seaplane. 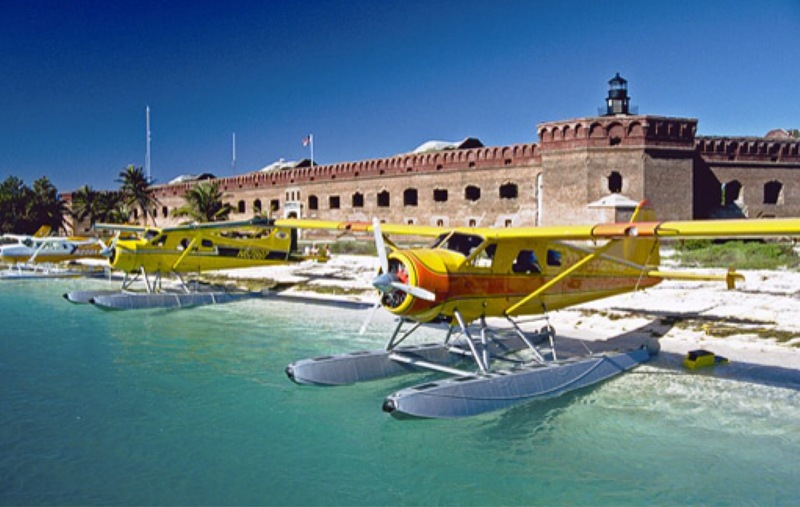 In the picture below a row of planes are parked on the beach outside the entrance to Fort Jefferson. 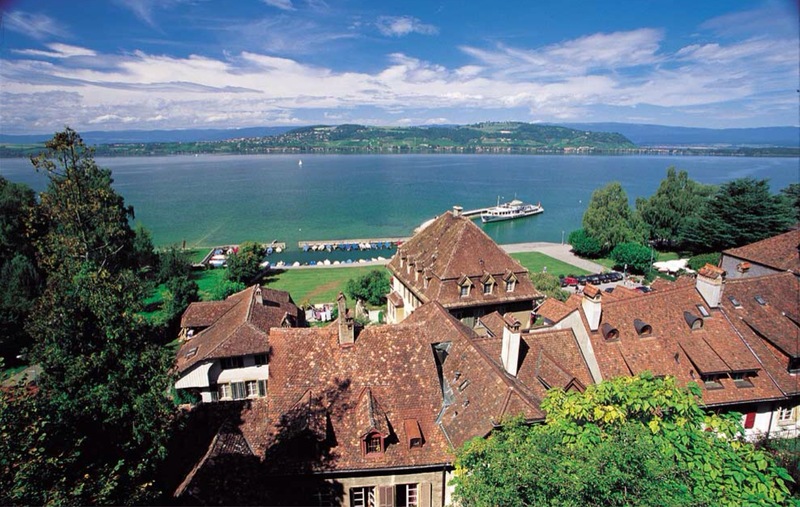 In fact, the island was used as a seaplane base during World War II. The walls are surrounded by a moat. 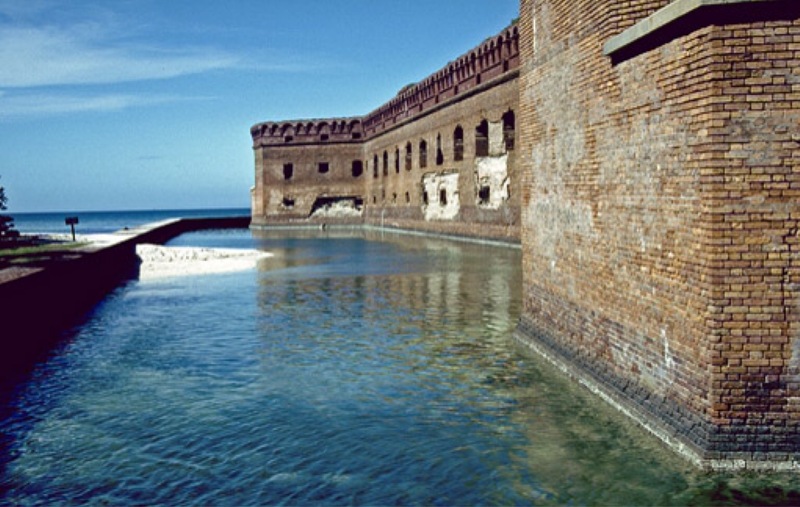 Although it might seem strange that a moat would be necessary outside a fort surrounded by miles and miles of ocean, it was intended to provide protection against not only potential invaders but also the relentless pounding of the surf. The view below looks toward the east along the south wall. The view below looks the opposite way and provides a clear view of the relationship of the moat to the walls of the fort. 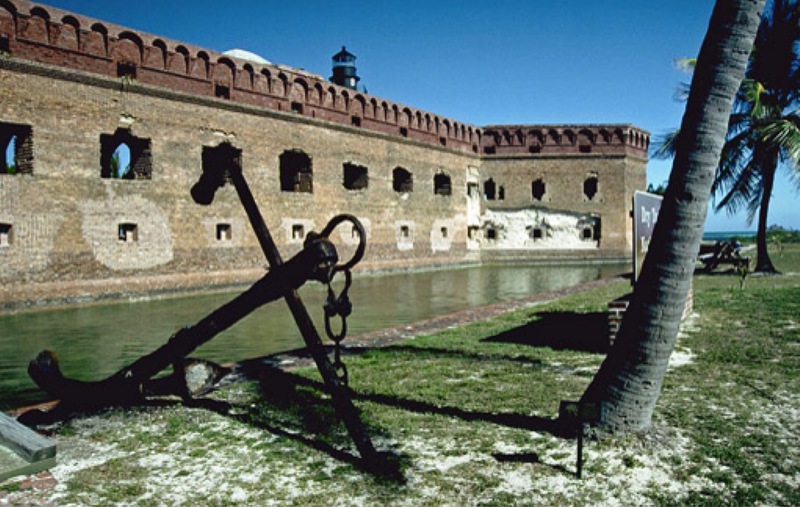 By any estimation the building of the fort was a remarkable engineering accomplishment. The foundation was laid 2 feet deep and 14 feet wide, underwater. The walls of the fort are 8 feet thick and about 50 feet high. Another view of the entrance to the fort can be seen in a picture taken from on top of the walls. The bridge (seen in the center of the picture) replaces a drawbridge which used to furnish the path across the moat into the fort. 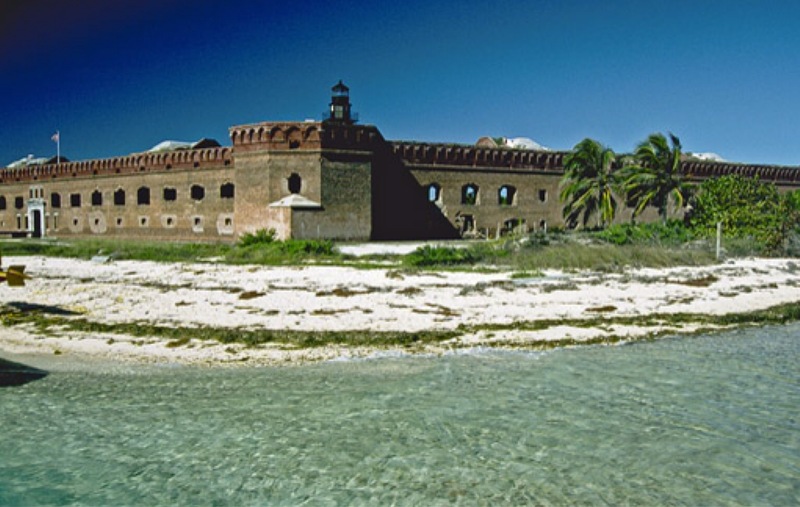 Fort Jefferson itself is six sided building constructed of 16 million hand-made red bricks. A closer view of the moat can be seen in this shot looking east toward the entrance of the fort. 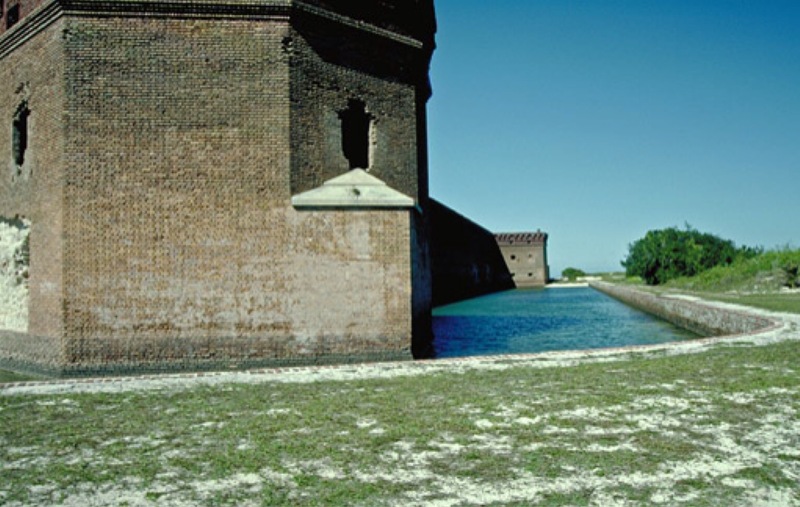 Construction of the moat was also an engineering challenge and was not completed in 1873. A view of a corner turret land a eastern wall is shown below. This section of the wall lies on the southwest portion of the fort. A walk, which lies on the outer wall of the moat, can be seen in the upper left portion of the picture. 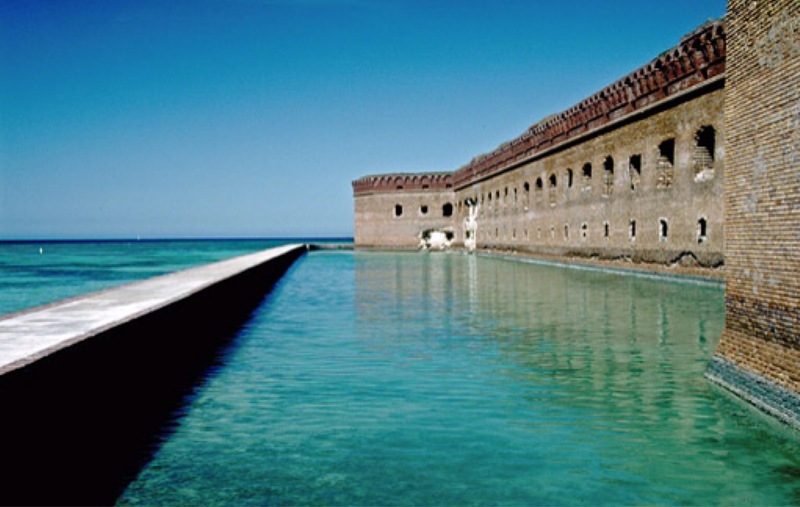 The moat is filled with sea water and turtle grass, jellyfish, sea squirts, yellow stingray, queen conch, mangrove snapper, bristle worms, sea cucumber. Although the walls are generally in good condition, in places considerable damage can be observed. Some of this damage has occurred as a result of a poor foundation which, by 1857, had already caused the walls to begin cracking as it settled. Other damage resulted from the accumulated effects of the powerful hurricanes which have periodically pounded the island.